This 30 day South America adventure will see you visit some of the most incredible destinations including Iguazu Falls, Machu Picchu & the Galápagos Islands. Bienvenido! Welcome to Santiago, the capital of Chile. 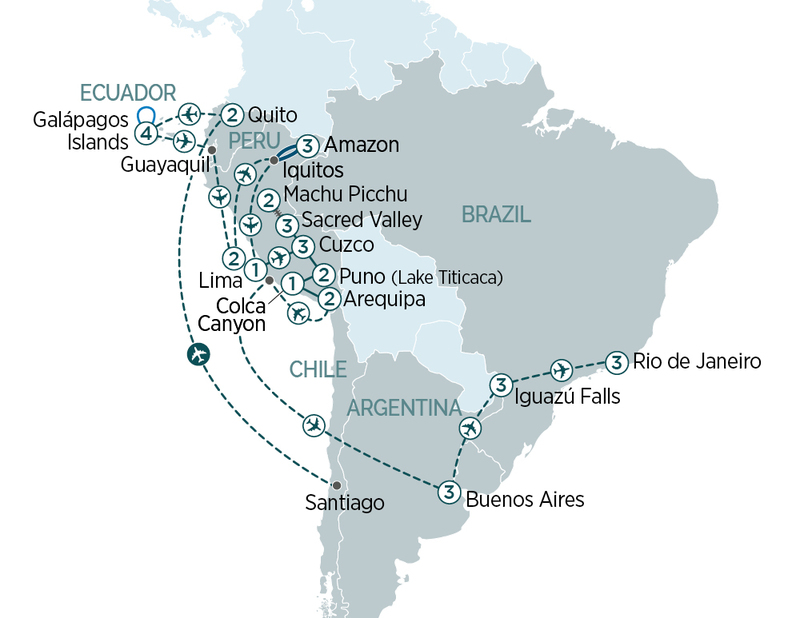 Located at the base of the Andes Mountains, this is the ideal South American city to start your journey. You will be met and transferred to your hotel. This evening, meet your Tour Director for a tour briefing. In the afternoon, take a guided tour of Santiago. Visit the central square or Plaza de Armas housing buildings such as the City Hall and Cathedral. See the impressive Moneda’s Palace which is the seat of the President of Chile. Be intrigued by the Central Market, then finish with a funicular ride up Cerro San Cristobal and enjoy magnificent views over the city and mountains. Fly to Buenos Aires, Argentina, a country rich in history and culture. Buenos Aires is a sophisticated city with a strong European influence. Get acquainted with this beautiful city known as the “Paris of the Americas”. Visit the central square, Plaza de Mayo surrounded by the Casa Rosada (Presidential Headquarters) and the Cabildo (Colonial Town Hall). Travel through the streets of San Telmo, the home of Tango and down the colourful roads of La Boca. You’re Invited: This evening, soak up the sultry moves of a tango show accompanied by a sumptuous dinner. Today is free to explore Buenos Aires. Fly to Rio de Janeiro in Brazil. Rio is a city full of life, colour and vibrancy mixed with tropical coastal scenery and is a fun city to visit. Today, we tour the sights of Rio de Janeiro. Ride the cogwheel railway up Corcovado Mountain and see the ‘Christ the Redeemer’ statue. Take the cable car to the top of Sugarloaf Mountain for amazing views. You’re Invited: Get to know how the locals party with a visit to the Sambadrome, the site of the famous Rio Carnival#. This evening, feast like a local with a typical churrascaria. Enjoy a free day to get to know more of Rio. Fly to the World Heritage listed Iguazú Falls. Set in a tropical jungle, an enormous river spills over towering cliffs to create a thunderous roar. Tour the majestic Brazilian falls and make your way through the rainforest and along walkways up close to the base of the falls for outstanding views. Tour the Argentinian side of the falls which follows a number of walkways over the top of the falls for incredible up close views. We board the ecological train and ride to the ‘Devil’s Throat’ viewpoint. Feel the spray of the water and gaze in awe at one of the most spectacular views that Iguazú has to offer. Fly to Lima, the capital of Peru. This bustling city, known as the “City of the Kings”, is rich in history and culture. Fly to Cuzco, the ancient capital of the Inca Empire set high in the Andes Mountains. As you transfer to the Sacred Valley, stop off at Awana Kancha llama farm and textile centre. Gain an insight into the Andean camelids; llama, alpaca, vicuña and guanaco as well as viewing traditional Andean weaving techniques. This afternoon, we head into the colourful town of Pisac with its traditional markets. Enjoy a walking tour of the town of Ollantaytambo. Visit to a traditional home to see how the locals live, then see the incredible Incan fortress that overlooks the town. You’re Invited: We will then visit a local community which will give you the chance to meet the students and teachers at the local school and learn about their lifestyle. Transfer to the train station and board the Vistadome train for the journey to Machu Picchu. Mystery still surrounds these well preserved ruins perched in between sheer cliffs. Your expert local guide will share stories to reveal some of the mysteries of this “Lost City of the Incas”. Spend the morning exploring Aguas Calientes before reboarding the Vistadome train back to Ollantaytambo. Return to Cuzco across the patchwork fields of the Chinchero plateau. Be guided on a walking tour of the charming city of Cuzco, a World Heritage listed site that was a former capital of the Incas. Visit the Inca temple of Coricancha, head through cobblestone streets and past ancient Inca buildings to Cuzco’s fascinating central market. Explore Inca ruins including the fortress of Sacsayhuaman, and finish with a visit to the beautiful main plaza and its surrounding cathedrals. Today is free to wander the cobbled streets of Cuzco and learn more about the traditions of the Inca. Tonight, dine at a local restaurant that specialises in nouveau Andean cuisine. Fly to the city of Iquitos. Board the La Perla for a three night cruise on the Amazon River. Visit to the Pacaya Samiria reserve to observe the Charapa Turtles. After a picnic breakfast, we will have the opportunity to swim in the river next to the pink dolphins. Take a trip to the hanging bridges to enjoy the landscape from the treetops. In the afternoon, observe a shaman ceremony. At night, explore the “Mirrored Forest” that reflects the surrounding scenery. This morning, try your hand at piranha fishing and in the afternoon, visit the Kukama Prado indigenous village to learn about their ancient traditions. Enjoy one final excursion and watch the sunset over the Amazon River. Travel to a Manatee Rescue Centre and see how the manatees are cared for and prepared for re-introduction into their natural habitat. Return to Iquitos for your flight to Lima. Fly north to Guyaquil located near the coast of Ecuador and is the jumping off point for your Galápagos cruise. Your cruise will visit various islands, beaches, bays and inlets to reveal the bounty of wonders in Galápagos. Each day, you will be taken on guided walks, excursions and boat tours to discover the unique landscapes and wildlife. Your cruise will visit various islands, beaches, bays and inlets to reveal the bounty of wonders in Galápagos. Each day, you will be taken on guided walks, excursions and boat tours. Bid farewell to this natural wonderland and ?y to Quito, the capital of Ecuador that sits right on the equator. You will be met and transferred to your boutique hotel. Transfer to the airport for your departure flight. Chau!